Constructed of disposable glass and conforms to DIN ISO 7550 standards. 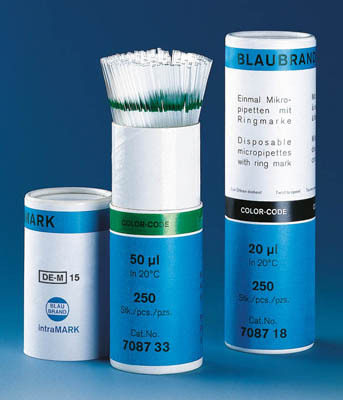 BRAND™ Blaubrand™ IntraMARK™ Disposable Micropipets include ring mark, and are CE-marked according to IVD Directive 98/79 CE. All surfaces are fire polished for smoothness and to minimize pipet adapter wear. Color-coded to ISO for clear identification. CE-marked according to IVD Directive 98/79 CE. The aspiration end is also fire polished to minimize pipet adapter wear. Color code to ISO for clear identification.